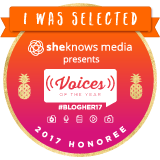 This guest post is from Diane Quiroga, a wonderful person who used to be a teacher's aide at Max's old school. I always thought she was super-sweet, and she adored Max. We lost touch. Then she happened to find this blog and emailed me; in the last few years, she'd gotten her degree in art therapy. She is now a certified art therapist, mental health consultant, and child counselor. Diane's come over to the house to do art therapy, and both kids have loved it. I've picked up great tips from her. So will you! Art therapy is a psychotherapeutic service and form of expressive therapy that gives kids the chance to participate in creative, nonverbal expression through the use of art materials. In other words, art therapy communicates when words simply cannot. This is by an 8-year-old boy with ADHD and autism. He really enjoyed the sensory stimulation from various materials, especially the "hair" picked up at a dollar store. 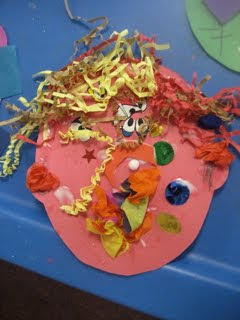 Art therapists are professionals trained in both art and therapy. Art therapy can benefit anyone at any age. It supports and encourages children to express feelings, enhances social skills and cognitive functioning, resolves frustrations, fosters coping skills, and increases the use of sensorimotor skills including hand-eye coordination and sensory stimulation. Remember that feeling of pride you got when you saw your artwork hanging in the school hallway or on your fridge? 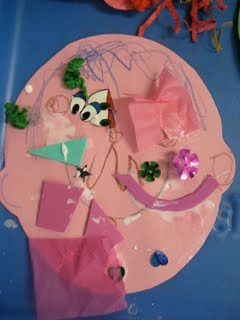 When kids are given the opportunity to express themselves, they achieve a true sense of self and identity. They are able to evaluate choices, establish preferences and have a sense of accomplishment. These feelings strenghten their egos! It helps them become who they are! It gives them the confidence to continue to explore! A 6-year-old boy with global developmental delays created this. He was able to discuss his favorite color being blue! As the parents, therapists and teachers of kids with special needs, we are more than well-versed when it comes to thinking outside of the box. Through my years of experience, I've had to evoke all types of creativity when it comes to adjusting and adapting art-making and material. The following troubleshooting tips I've discovered will hopefully offer you as much success as they've offered me. 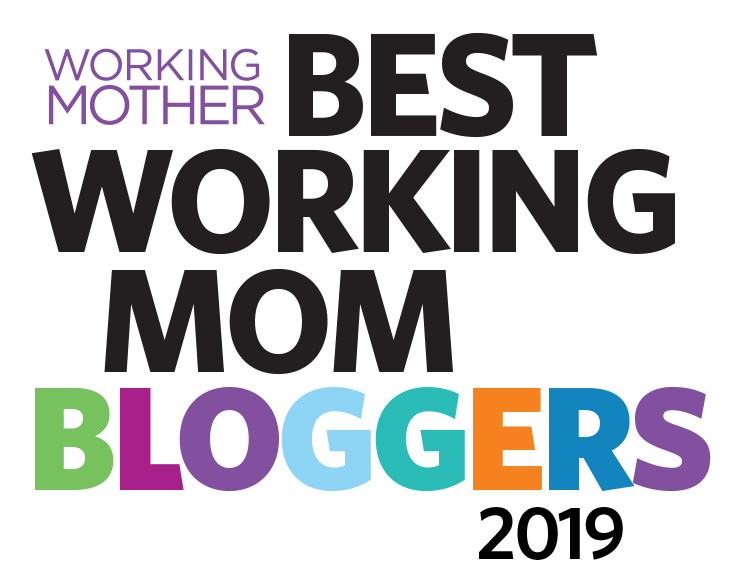 My motto: Do whatever works! The solution: Art making should be a pleasant experience, so I make sure to start with a fun activity that can be completed easily. 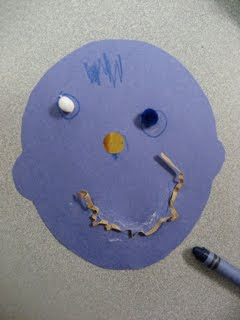 Scribbling is the best way for a child to practice fine motor and pre-literacy skills, as well as art making. 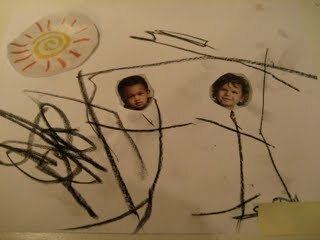 Creating an art "starter sheet" for your child will decrease the anxiety and intimidation they may feel when faced with a blank sheet of paper. A "starter sheet" is essentially a piece of paper that you start by placing magazine cut-outs or drawn items for your child to complete on their own. Their inspiration and fun can begin quickly and without apprehension! The solution: Using a tray with a lip can create a boundary and automatically make it easier for kids to control materials inside the space. You might already have an item in your house that can service this purpose, such as a cookie sheet or even the top of a gift box. 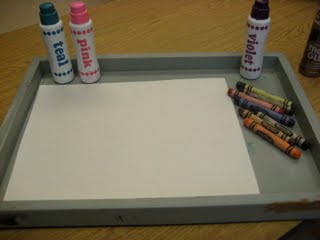 Lining paper on a tray, sheet or box will keep your child working inside the boundaries of the object and help them become more aware of the paper limits. 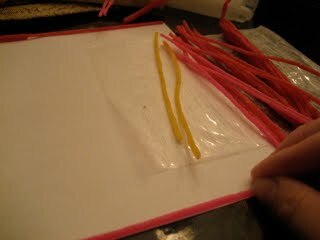 The solution: There are several tricks you can use to create boundaries, including lining the borders of your paper with Wikki Stix or Bendaroos (brightly-colored, non-toxic wax sticks that can be sculpted and adhered to basically anything). 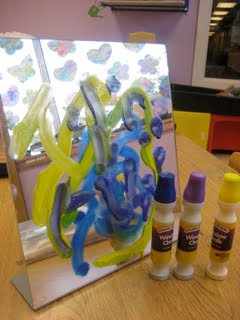 These waxy wonders will create a small barrier to prevent your child from veering off of the paper. If your child gets too distracted by the bright sticks, squeeze thin lines of Elmer's glue all around the edges and let dry to create a clear, invisible boundary. Don't have time for glue to dry? Use colorful masking tape around the edges instead! 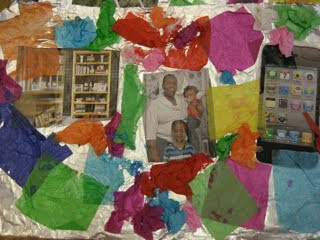 The solution: Use a large piece of foil or sand paper as the art surface. 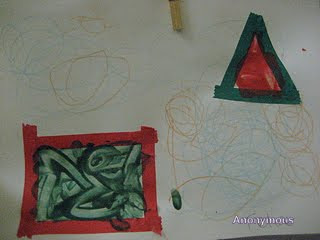 Kids can paint, draw with crayons, or collage on these surfaces for a little extra sensory input when making art. More options include using a stand-up table mirror, table easel, or an actual window in your home. Window crayons, window chalk, or window markers can be used on these surfaces and your child will love drawing on their own reflection or on outside scenery. The solution: Contact paper or Saran Wrap. These are great transition materials and your child can try to place pieces of tissue paper or magazine pictures onto these different textures. Getting their fingers to occasionally tap down on these paper substitutes will help ease them into the feel and texture of sticky substances. 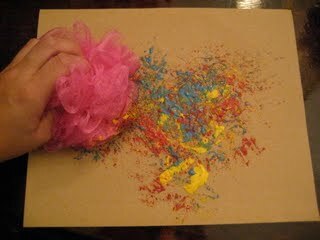 Helping them peel foam stickers to decorate an art piece can also expose them to "the sticky" while maintaining the fun! The solution: For getting kids more comfortable with paint, try helping them get used to touching the squishy texture while keeping their hands clean. 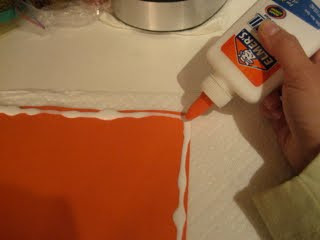 First, squeeze paint onto a large surface of Saran Wrap, then top with another layer of Saran Wrap. 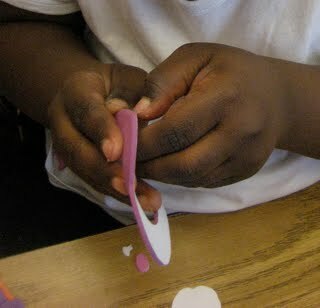 Now your child can use their hands on the paint texture without getting dirty! Still experiencing some tactile defensiveness? 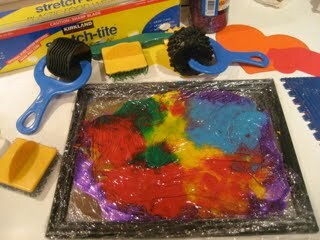 Try using a brush or stamps on the Saran Wrap surface for beginners. Kids might eventually take to rollers, which offer movement, sensory stimulation and fun. Below are paint and clay rollers from Sax School Specialty. The shapes and stripes roller in the first photo up above are from Discount School Supply; Lakeshore Learning makes great ones, too. You can also line a tray or framed mirror with Saran Wrap, as seen in this picture, for both easy cleanup and a boundary. 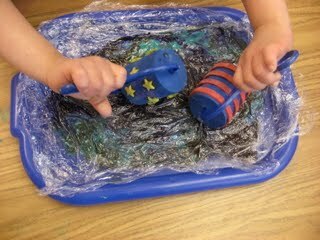 The solution: Depending on attention span, I alternate the art activity with a sensory activity such as sand tray play or squeezing some Model Magic. Some kids simly can't sit, so my focus becomes increasing their attention span through a non-conventional mode of art making. 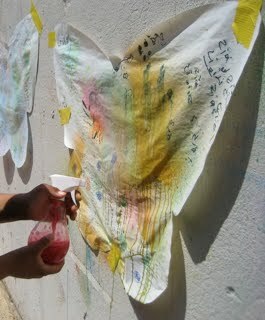 In those cases, I might tape a large mural paper on a wall outside or use gravel on the ground as a surface. You can also tape a large piece of paper underneath a table while the child lies on a mat or foam wedge as they paint—like the next Michelangelo! The solution: Exposing your child to other art is a great first step to creating and developing new visual imagery in the brain. Laminated museum art cards are perfect to introducing kids to new colors and images. 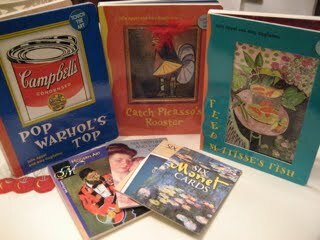 Children also love the Touch The Art Series by Julie Appel and Amy Guglielmo, board books that incorporate famous works of art into a story. Every picture has texture touch spaces to make each page interactive and fun! Many of the materials here can be purchased through Discount School Supply, Sax Art Supply, Triarco Arts & Crafts, Lakeshore Learning and your local A.C. Moore and Michael's store. If you want to seek out an art therapist, visit the American Art Therapy Association website and check the Art Therapy Locator, which lists art therapists by state. Make sure your art therapist has received the proper training, and beware of imposters! Hopefully, I've taught you a bit about the field of art therapy, given you some useful tips, and sparked your interest in this effective therapeutic intervention. Looking for more info? Please visit my site to find out about events, Facebook groups and links. What a great idea for a post. Thanks Ellen for sharing Diane with us. I'm thinking I can use some art therapy for stress relief :) Perfect timing since this gave me some ideas for Christmas gifts. Diane, you are an amazing resource. Love these tips! My brother (who has autism) attends a lot of art workshops and seminars and he seems to like it. Some of these are great ways to encourage him to keep at it. Thanks so much! I love this and think it is a great idea for all kids. Thanks so much for sharing. Lots of wonderful ideas here. Wow could I have used this little barrel of suggestions a few years back! How great that it's out there now for others to pick through, so thanks to Diane for her tips. Ellen, you've got some of the neatest friends! I'm so glad I saw this post! I struggle with doing art with my son Paolo. The challenge and solutions really gave me some great ideas that I can't wait to try! Thanks for the great post. Thank you all for your kind words. I am so glad Ellen asked me to share my passion with all of you. I think it's wonderful that you think your son would benefit from art therapy-- Children that enjoy art making are great candidates for the service. There are many art therapists in NYC, in fact the Expressive Therapies Summit is happening there right now. What you want to keep in mind is finding an art therapist with the credentials ATR-BC (Board Certified and Registered Art Therapist), or LCAT (Licensed Creative Art Therapist) after their name. If you click on "NY," it will take you to the portion of the list of art therapists located in NY. Hope this helps! 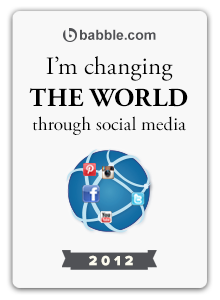 Feel free to contact me at info@dianequiroga.com if you have any further questions. Awesome awesome awesome post! I've already found two art therapists in our area. Thanks so much for sharing all these great ideas and resources. I am spreading the word to friends whose kids can benefit. I love this post! These are some great ideas. The link to Diane's site is not working. This has been an amazing help for me and my special needs students! I am an art teacher with a special ed certification and I am finding that more and more we are keeping our special needs kids in our district and I now teach a special needs pre school class art, as well as a multiply disabled class several times a week. I have been frustrated trying to find meaningful experiences for them in art class. Thank you, thank you, thank you for so generously sharing....I will use all of these ideas! I'm an art therapist working with children with special needs and autism as well, and just found this post through an art therapy resource. 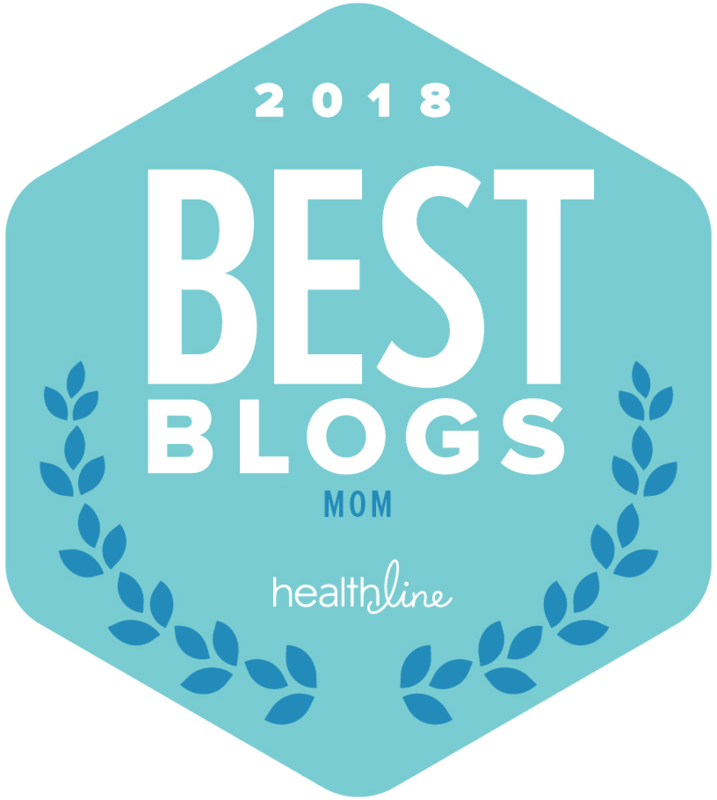 Great article, Diane! It's so great to hear from other people who are passionately working with this unique and exceptional population! Great article! I have a question, I am an art teacher and I teach art at my son's school where they have varying degrees of autism. 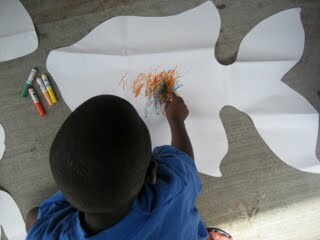 I'm having trouble finding art projects for some of the children because they tend to eat the art supplies. So I've been asked to not use paint or clay with them. Any suggestions? The idea with contact paper and plastic wrap is cool. And I've done the zip lock bag. Any ideas would be great. I think they really enjoy doing art.